Hands up how many of you reading this post knew that Clyde have had five different homes in their 134 year history? I certainly didn't! The sad part of this story is that because of all this, Clyde have found it increasingly difficult to retain a steady and loyal fan base. The gradual decline in the numbers watching Clyde from 1986 until now is somewhat understandable considering that a team, previously based quite centrally in the city, were moved within that city to ground-share with their “bigger” and most fierce rivals............then 15 miles outside of the city to another town entirely, with its own well-followed side..........and then finally to an entirely new territory which, previously, has no experience of even having a football stadium there. And yes, the stadium did nearly see SPL football at the end of the 2003-04 season when Clyde were within a point of promotion to the top tier.....but those days are long gone. Instead, I was watching a Clyde who are bottom of Division 3 and statistically speaking, the worst team in the Scottish football league. 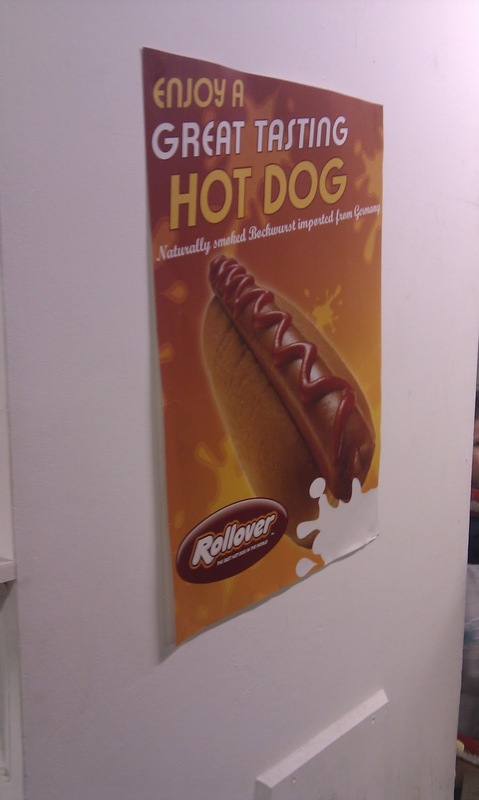 I was excited, though. Even though the Bully Wee are bottom of the table, they had been undergoing somewhat of a revival under the guidance of the ever baldy Jim Duffy. Their opponents, Arbroath, were topping the table and meant to be playing some very nice football. 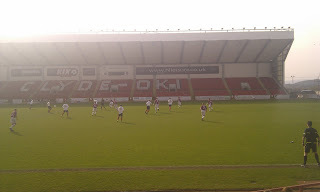 Arriving at the ground, it was obvious that (much like New Broomfield) Broadwood was built for and belonged in the SPL. Purpose built stadium, sizable capacity. However, also like Airdrie, an attendance of only around 700 turned up for the game. That said, there was a buzz about the place...an expectation....an air of excitement. 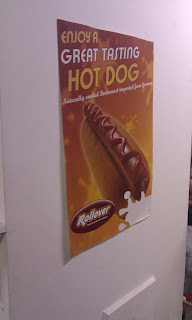 These Hot Dogs were also curiously served in a completely separate part of the stand from the rest of the catering. Clearly just too damn tasty for the Scotch/Steak/Macaroni pie to compete with. Either that, or massively risky to people's health and...based on some of the haircuts around me...I wondered if the processed “meat” somehow resulted in the women having a desperate urge to look like 80s female Rock legends HEART and for the young lads to grow such ludicrous rat's tails haircuts that they could easily pass for a member of the cast from 80s kids show THE RACOONS. The 85 year old female paramedic also didn't sit too comfortably with me – I know Clyde have had some financial problems, but to get your Gran along, dress her up in an over-sized paramedic's outfit and sit her at the pitch side in the boiling hot sun is not a particularly clever idea. Unsurprisingly, she disappeared off after about 10 minutes. Probably away for a lie down – poor love. Thankfully, she wasn't really needed. In fact, Clyde needed more than medical help to be able to handle Arbroath who were simply a class above from the off. They were everything that their struggling hosts were not – comfortable in possession, controlled at the back, sharp in midfield and extremely dangerous up top. To a man, they were superb from Danny Griffin at the back, through to Falkingham in midfield and the quite superb Gavin Swankie up front. The latter in particular put on one of the most impressive performances I’ve seen from a player in all the matches so far. Clyde on the other hand really struggled to get near their guests and aside from a good run and long distance hit from Mark McCusker which hit the Arbroath post early on, they were pretty hapless. The lack of quality in the team is certainly a factor here, but the performance of Paul Sheerin's men was more so, especially after Keith Gibson put them 1-0 up after 20 mins. And if the second goal, scored by Adam Strachan was good (nice inter-play, cut back from wide right and smashed in) then the third was even better as Gavin Swankie brilliantly turned away from his marker wide on the right, drove at the defence and again, after a tidy cut back, saw a team-mate smash it home – this time Paul McGowan. Pleasant viewing for the vocal Arbroath support who had made the journey down from Angus in their numbers. Less so for Clyde “legend” Craig Napier who was introduced to the crowd before the match and was the special guest for the day. For those of you wondering, Craig played over 150 games for the club, scored around half a dozen goals and won 5 caps for the Scotland U-21s. I will attempt to sum up without saying much more about how good Arbroath were. I'll leave you to judge for yourself next season when they're in Division Two as I have no doubt they will go on to win Division 3. As for Clyde, well it's all a bit depressing for the Bully Wee. Rock bottom of all the leagues in Scotland and having just announced they will be looking for ANOTHER home again in the near future. 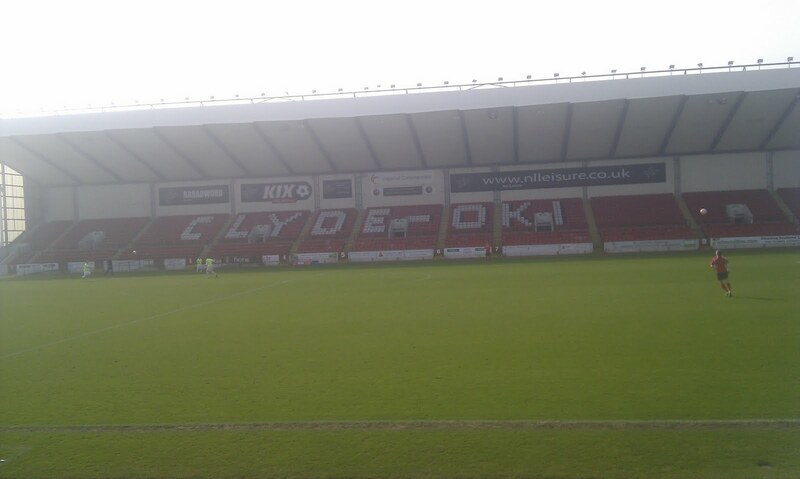 It makes you wonder if Clyde, like Airdrie, will ever make it back to being a force in the top two tiers again? Or if the changes at both clubs have been so drastic over the last few decades that each are too far gone? Clyde: another Scottish club who fought back from the edge of financial ruin to survive – but at what cost? What is left of the Clyde that once challenged the Old Firm for the affections of Glasgow's punters? Star Man: Gavin Swankie (Arbroath) - the former Perth Saintee showed he's can operate at a much higher level than Division 3. I shall say nothing more. Based on all my chat since the game, the wife already thinks I'm cheating on her with him. Catering: £2.90 for a tea and a pie – the latter extremely tasty. Tea on a hot day though, a terrible decision. If Ron Burgundy thought milk on a hot day was a bad choice...8/10. 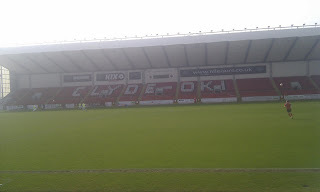 Recommendation: I had a great day out at Clyde. Even though they were pretty rank rotten, there was something quite nice and endearing about it! Seem like a nice local club to follow. Problem is, of course, nobody bloody knows where "local" is likely to be!